In 1 Cor. 15:4 Paul writes that “He was buried, and that He was raised on the third day according to the Scriptures.” However, Paul does not say what Scriptures he is referring to or thinking about in writing this. This is understandable in that Paul is reminding the Corinthians of what he had already “delivered” to them by way of central Christian beliefs, so any proof-text or texts that he had in mind would have been secondary to his purpose in writing. He also would no doubt have told them previously in person what Scripture he had in view as part of the extended teaching on this important subject. The absence of a specific mention in his letter, however, has given rise to much speculation. Some hold that Paul had no specific Scripture in mind, but that he was referring to the entire Scriptural narrative and that this somehow leads to the conclusion that the Messiah was to rise from the dead (see for example N.T. Wright, The Resurrection of the Son of God, 321). This is both unconvincing and unsatisfying. The issue is complicated somewhat by uncertainty over whether Paul thought that the Resurrection on the third day was anticipated in the Hebrew Scriptures, or just the resurrection of the Messiah (Christ) and that it just so happened to have been on the third day. There is a reference to Israel being revived on the third day in Hosea 6:2. Some of the church fathers from as early as Tertullian utilized this as a proof-text that might have fit in with Paul’s background thinking. However, none of the New Testament writers ever allude to this passage. In fact there is an OT Scripture which is used as a proof-text for the resurrection of the Messiah in the NT, namely Ps. 16:10: “For You will not abandon my soul to Sheol; Nor will You allow Your Holy One to undergo decay.” In the book of Acts both Peter and Paul make use of this passage to show that it must have been referring to Christ since the author, David, died and his body decayed (see Acts 2:27 and 13:35). It makes no difference if the skeptic thinks that this is the wrong way to do exegesis on Ps. 16:10; what we’re after is finding out what the apostles believed about the Resurrection. And it is undeniable that using this passage in this way only makes sense if the Resurrection of Jesus was understood as involving his physical body (not to mention that it only works if his body was not buried long enough to have decayed). The skeptic can retort that these passage are found in Acts, which they take as a later source that is full of legendary development. The author of Acts no doubt held that the resurrection was physical, but this doesn’t give any proof of what the apostles believed. Speeches in ancient historiography are considered by some to been completely unreliable in general and were sometimes viewed as an opportunity for the historian to display their skill in composition. To this we respond that a considerable body of evidence has been amassed in recent decades to support the traditional view that Acts was written by a companion of the apostle Paul and is not as late a document as previous generations of scholars presumed, a conclusion which has gained increasing recognition in New Testament studies even among skeptical scholars. Also, the views of ancient historians were not as lop-sided as some have made out; Thucydides for example said that when composing speeches he still tried to be faithful to the gist of what was said. Furthermore, Luke’s speech summaries in Acts are short and give no indication of the kind of elaborate rhetorical adornment that characterized the speeches in some ancient historiography. The question here is not whether Peter and Paul gave these particular speeches on the occasions in question (that would be extremely difficult, if not impossible, to prove), but whether or not Luke is faithful in holding to what the apostles taught. There can be no doubt that whatever proof-texts the apostles used for the Resurrection would have been used on multiple occasions, so Luke would have had ample opportunity to be familiar with their method. Other considerations point in favor of a positive conclusion. First, Paul’s use of Ps. 16:10 is somewhat different than Peter’s in that he combines it with different OT verses in a way that was characteristic of rabbinic exegesis. Thus Paul’s version of the speech looks more like what one would expect from a trained rabbi, which Paul was (and Peter was not). Second, the use of Ps. 16:10 would have been of value against a Jewish audience since it was intended as Scriptural proof that the Messiah was to rise from the dead. This would have been of little or no import to a Gentile audience. Thus it is unlikely that this use of Ps. 16:10 was a later invention by an anonymous Christian writer, writing long after the destruction of the Second Temple and the schism between Jews and Christians was complete. Third, Luke’s handling of speech material from Mark (it is virtually unanimously agreed that Luke used Mark as a source) shows that he was quite faithful to his sources with very little embellishment as a historian. Thus there is good reason for thinking that he was also faithful to his sources for the speeches in Acts and didn’t simply invent things. The glorious promise of Easter is that Jesus’ followers will also be resurrected one day: "For this is the will of My Father, that everyone who beholds the Son and believes in Him will have eternal life, and I Myself will raise him up on the last day." Tomorrow is Easter Sunday, and so I commend the remembrance of this great promise and the celebration of it to all. On behalf of all of us contributors, Happy Easter to all of our W4 readers! John, I appreciate this very much. I had not thought of the specifically physical implications of the apostles' use of Psalm 16, and it is an excellent point. A happy Easter to you and yours and to my other fellow contributors and our readers! Thanks, John, for this timely and thoughtful post. He is risen indeed! To John and all our dear friends: He is risen indeed. Hello John, I hope you don't mind but I quoted you in my own post today. Thanks for writing this, very insightful. Great post, John. An excellent reminder to us all to read carefully what the Apostles themselves say about the matter. I don't know much about 1st century Jewish culture outside of what is in the Bible, but wouldn't it be the case that "resurrection from the dead" would have been assumed by all parties (who had not experienced a glorified body) to be resurrection to a standard physical state? If so, wouldn't the Gospel narratives that have Christ telling Thomas to examine his wounds and "put your finger in my hands" be completely bizarre with their cultural expectations? Generating a mythos like that would be, I think, comparable to making up Paul Bunyan and Babe the blue ox stories and getting people to take them as serious, faith-altering stories. If so, wouldn't the Gospel narratives that have Christ telling Thomas to examine his wounds and "put your finger in my hands" be completely bizarre with their cultural expectations? Absolutely, Tony, but there are those who will say that this "physicalist" account was a later addition to the story and not really what the apostles told. As I discussed in my own "maximal data" post, I have a particular response to this in terms of arguing for the historical reliability of the gospels and Acts and therefore that these accounts (including the Thomas account) represent the actual testimony of the disciples. Some (as John points out, NT Wright) argue more from the _general_ Jewish culture and ideas about resurrection known from other sources. And John's point about Psalm 16 argues reliability to the point of accurately reporting that _that_ text was used to argue that Jesus fulfilled prophecy in his resurrection. Each response can be regarded as complementing the other. John, do you not think that its also plausible that Paul was referring to Jonah in 1 Cor. 15:4? After all these scriptures are what Jesus Himself refers to as the 'sign', recorded in Mat 12:40 & Luke 11:30. So isn't it possible that Paul would have known about this story of Jesus making these personal references and allusions to those scriptures? I accept the immediate question one would ask, though, is why didn't Paul or Peter make any explicit references to this themselves? John, do you not think that its also plausible that Paul was referring to Jonah in 1 Cor. 15:4? After all these scriptures are what Jesus Himself refers to as the 'sign', recorded in Mat 12:40 & Luke 11:30. That suggestion has been made by some scholars, so I wouldn't rule it out. I would say that Ps. 16:10 was definitely in the background of 1 Cor. 15:4, but it's also possible that there was more than one passage in view. It depends if the plural use of "Scriptures" meant that there was more than one verse or if it meant that there was a verse in the Scriptures. I do think that Jesus' use of Jonah 1:17 is a little different in that he seems to be using it almost metaphorically, as opposed to how Peter and Paul use Ps. 16:10 which is closer to what we would think of as a direct prophecy. But actually I would think Jonah would be a better fir for the "third day" motif than Hosea 6:2. I mentioned the Jonah passage in my longer paper on this topic but left it out of this truncated version. Thanks for your comment and kind words. Paul includes himself in his list of those to whom the risen Jesus “appeared”. He makes no distinction, but in fact equates, the appearance of Jesus to him and the appearances to others. The Greek verb Paul uses for all these appearances he mentions is the same one – ὤφθη (Greek - ōphthē) meaning “appeared, was seen” – in each case. Certainly no one actually thinks the Macedonian man’s body was actually standing in front of Paul when he “appeared” to him? Same thing in Matthew 17:1-3, Moses and Elijah “appeared” (ōphthē) to Peter. Did they physically appear? Should we start looking for their empty tombs as well? The word is used in the LXX (Greek translation of the OT) to describe how the Lord God appeared to the patriarchs (e.g., to Jacob in a dream, in Gen 31:13). In the LXX stories that use this word, the emphasis is more on the presence of God and on its power to reveal than on the “reality” of the experience. We know from the book of Acts, Paul’s description of his encounter on the Damascus road makes it clear that this was a vision – a light from heaven and a disembodied voice – not an encounter with a physically-revived former corpse returned to life. We also know that the companions of Paul did not see or hear the vision/voice properly. As far as the appearances go Paul makes no distinction, but in fact equates, the appearance of Jesus to him and the appearances to others in 1 Cor 15. So if we’re to take the accounts Luke portrays in Acts 9:3-8, 22:6-11, 26:13-18 as accurate then the appearances mentioned in 1 Cor 15 were “visionary” in nature. "the general conviction in the earliest Christian preaching is that, as of the day of his resurrection, Jesus was in heaven, seated at the right hand of God. Resurrection and exaltation were regarded as two sides of one coin…"
Somehow this comment escaped my notice until just now. You are correct that Paul uses the same word for "appeared" in both his case and in the case of the other apostles, and that this implies that their experiences were of the same nature. But you strangely give a couple of quotes from the TDotNT as if they support your point when in fact part of the second quote says this: "In all the appearances the presence of the risen Lord is a presence in transfigured corporeality, 1 Cor 15:42. It is the presence of the exalted Lord from heaven. This presence is in non-visionary reality; no category of human seeing is wholly adequate for it." The parts I've put in bold support the view that the appearances were non-visionary (in other words, not visions) and corporeal (ie. there was a real body there, albeit one that had been transfigured or transformed). I could say more about that, but I'll leave it there for now just to point out that you apparently did not carefully read or understand the quote you selected. I always find it ironic when skeptics, whose normal position is that Acts is a late work of fiction, suddenly start finding it to be a reliable source when it comes to Paul's conversion experience. Except that they invariably make a hash of it as you have done here. Paul's description does not make clear that this was a vision. In fact he describes it using the word optasia in Acts 26:19, which is translated as vision ("heavenly vision"), but is better understood as an appearance as Ben Witherington argues because it's not the word which is used for a purely subjective vision. That word would be opama, which is used to describe for example Peter's vision of the sheet with the unclean animals in Acts 10 and 11. In fact opama is specifically differentiated from an objective experience in Acts 12:9 when an angel breaks Peter out of prison and it says that Peter thought it was a vision (opama) rather than something that was actually happening. So if Paul meant subjective vision, this is the word he would have used (or that Luke would have placed on his lips). But he didn't. Of course, if it was simply a subjective experience that Paul had then his companions would have been unaffected by it altogether, but in fact all three versions of the experience in Acts indicate that Paul's companions were affected. This by itself proves that the experience was objective, and actually when Acts 9:7 indicates that the companions saw no one, it implies that Paul did see someone. We aren't given enough detail to know exactly what happened with the companions, but the evidence is against Paul having a vision. There is also no reason why Luke would need to make the appearance objective and physical if it had been a vision. Jesus appeared to Stephen in a vision in Acts 7 as Luke narrates it. Paul's experience, however, was not like that. Also, keep in mind that Luke and Acts were written by the same author. Luke is absolutely clear that the post-resurrection appearances to the other apostles were physical. There is abundant evidence to indicate that Luke's narratives go back to eyewitness testimony, and that he was a co-worker of Paul. So Luke knew what Paul's teaching was and what the other apostles claimed. All of this tells against your argument. Not to mention the fact that you haven't even addressed the argument in the o.p. which shows that the apostles certainly preached a physical resurrection from the very beginning. In the earliest manuscripts of gMark there are no resurrection appearances and in chronological order, according to consensus dating, we have Paul c. 50 AD, Mark c. 70 AD, Matthew c. 80 AD, Luke c. 85 AD, and John c. 90-120 AD. So it seems the later Gospel depictions of bodily appearances were not the earliest Christian belief. This is called an argument from silence, but it's quite a poor one and I'm always surprised it gets as much mileage as it does. The original ending of Mark has no appearances because it ends with the women running out of the tomb. However, they were just told by the angel ("young man") in the tomb that Jesus was not there because he had risen. You can't infer from this anything about bodily appearances developing later. But you strangely give a couple of quotes from the TDotNT as if they support your point when in fact part of the second quote says this: "In all the appearances the presence of the risen Lord is a presence in transfigured corporeality, 1 Cor 15:42. It is the presence of the exalted Lord from heaven. This presence is in non-visionary reality; no category of human seeing is wholly adequate for it." Since it says "transfigured" that means it was not the same "real body" that once walked around and was buried. It was different. Paul envisioned a "heavenly" and "glorious" pneumatic body that rose to heaven. That is not the same description found in Luke and John where Jesus is seen interacting with his followers after his death. I always find it ironic when skeptics, whose normal position is that Acts is a late work of fiction, suddenly start finding it to be a reliable source when it comes to Paul's conversion experience. That Acts may contain other fictional elements is irrelevant to the fact that it contains Paul's own first person eyewitness testimony in Acts 22 and 26. You must accept it as such. Since this is the only firsthand report from our only eyewitness, it follows that the other "appearances" in 1 Cor 15:3-8 were originally thought of as similar in nature to Paul's vision. ...Paul's description does not make clear that this was a vision. In fact he describes it using the word optasia in Acts 26:19, which is translated as vision ("heavenly vision"), but is better understood as an appearance as Ben Witherington argues because it's not the word which is used for a purely subjective vision. That word would be opama, which is used to describe for example Peter's vision of the sheet with the unclean animals in Acts 10 and 11. In fact opama is specifically differentiated from an objective experience in Acts 12:9 when an angel breaks Peter out of prison and it says that Peter thought it was a vision (opama) rather than something that was actually happening. So if Paul meant subjective vision, this is the word he would have used (or that Luke would have placed on his lips). But he didn't. Luckily we don't have to rely on Witherington's apologetic obscurity because we have a precise description of the event from Paul himself. In that description he says that he saw a blinding light and heard a disembodied voice. This seems to be quite a normal thing for Paul since he admits to having "visions" and "revelations" - Gal. 1:12, 2 Cor. 12:1. Of course, if it was simply a subjective experience that Paul had then his companions would have been unaffected by it altogether, but in fact all three versions of the experience in Acts indicate that Paul's companions were affected. This by itself proves that the experience was objective, and actually when Acts 9:7 indicates that the companions saw no one, it implies that Paul did see someone. We aren't given enough detail to know exactly what happened with the companions, but the evidence is against Paul having a vision. The fact that the companions "saw no one" and "did not understand the voice" implies that this was a vision that only Paul had full access to. This means the "vision" was somewhat of a subjective experience. Paul was blinded and the others were not because, evidently, they carried him on to Damascus. Clearly, they weren't "affected" in the same way Paul was. There is also no reason why Luke would need to make the appearance objective and physical if it had been a vision. Jesus appeared to Stephen in a vision in Acts 7 as Luke narrates it. Paul's experience, however, was not like that. Also, keep in mind that Luke and Acts were written by the same author. Luke is absolutely clear that the post-resurrection appearances to the other apostles were physical. Since Luke clearly believed in the empty tomb and a bodily resurrection he has no reason to make up this entirely different "appearance" report in Acts 9, 22, 26. Since the report differs from Luke's other bodily appearances we have even more reason to regard the description in Acts 9, 22, 26 as historical due to the criterion of embarrassment. Why would Luke include the embarrassing fact that the companions "saw no one" if he wanted to be consistent and convey his belief in the bodily resurrection? Luke could have spiced the story up a bit and included Jesus' physical body appearing but he just didn't do that. This mitigates against Luke's own theological stance in which he depicts the Risen Jesus sitting down and eating with his disciples, providing "many proofs" and so on. Therefore, we have every reason to believe this is a legitimate report from Paul himself that reflects an earlier stage in tradition. Unfortunately, the only eyewitness account we know of is from Paul. So this assertion is merely wishful thinking at best. It's too bad that most of what we have is written in third person and filtered through a narrator who wasn't there writing decades after the supposed events. and that he was a co-worker of Paul. So Luke knew what Paul's teaching was and what the other apostles claimed. Good. So we have no reason to doubt Luke's transmission of Paul's firsthand report in Acts. It's too bad we don't have any firsthand records of what the "other apostles claimed" like we do with Paul. Not to mention the fact that you haven't even addressed the argument in the o.p. which shows that the apostles certainly preached a physical resurrection from the very beginning. I should clarify that even though Paul believed the resurrection was in some sense "physical" it does not follow that he believed the same body that was buried was the same one that rose out of the ground. Rather, he describes a transformation had taken place and the body was raised a spiritual "pneumatic" body. See Dale Martin's The Corinthian Body and Troel Engberg-Pedersen's Complete and Incomplete Transformation in Paul a Philosophical Reading of Paul on Body and Spirit for plausible alternative readings. There is actually no evidence that they were preaching a "bodily" resurrection from the beginning. First of all, Jewish literature is quite diverse on the views of afterlife and resurrection. N. T. Wright has since been refuted by Maurice Casey in his Jesus of Nazareth on this point. Secondly, the Greek word for raised "egegertai" need not refer to a physical body. Thirdly, Paul shows no knowledge of the empty tomb. It's lack of mention is quite suspicious considering it could have really helped his argument in trying to convince the Corinthians of a "bodily" resurrection. Fifthly, the fact that none of the NT authors ever cite Hosea 6:2 as being inspiration for the "third day" belief may imply that its use was quite early and had already left its imprint on the tradition at a deeper level than an explicit citation could warrant. Moreover, the point in time of testimony need not coincide with the origin of the relevant exegesis. The "third day" motif was quite common in Jewish literature and tradition. Aside from Hosea 6:2 there's Jonah 2:1, Ezra 8:32, the three day search for Elijah after his ascension in 2 Kings 2:17, corpse identification only after three days - Mishnah Yebamoth 16:3, Israel was never left in dire distress for more than three days - Est.R. 9, 2 on Est. 5.1, etc. If "three days" is interpreted like this then Jesus' Resurrection could be expected after three days. No it would be an argument from silence if I had said something like "since Mark has no resurrection appearances that means they didn't believe he appeared bodily" but I didn't say that. Instead, what I was getting at is that the story involves linear development in chronological order - (Paul's description of the encounter was not with a revived corpse, important details are added that are missing from earlier reports, bodily appearances don't occur until Luke/John). In light of this, my conclusions become inductively true because what we have here seems to show a legend growing in the telling. What would we expect if this story were actually true? A lot more consistency than we get. However, they were just told by the angel ("young man") in the tomb that Jesus was not there because he had risen. "Risen" in what sense? Did the author of Mark think that he was immediately taken to heaven? Where else could the body have gone? Apotheosis legends and rapture/assumption stories were quite common in this time period. You can't infer from this anything about bodily appearances developing later. In which work of ancient literature do we first find this expression: "...kick against the goads"? If you said the Bible, in which Jesus appears to Paul on the Damascus Road, you would be wrong. This expression was first used in a book of Greek mythology, "The Bacchae", written by Euripides in circa 450 BC. The expression occurred in a fictional conversation between the god/man, Dionysus, and the king of Thebes, his persecutor. The conversion was real but I bet you don't believe people today who claim they hear God speaking from the clouds or have similar conversion experiences to other religions. Not sure why you'd believe a 2,000 year old story which says the same thing. Actually, I was responding to commentator "gary," because his comment was short and silly in a way that was easy to respond to briefly. Your earlier comment, Celsus, is too long and too muddled for me to bother with. I have all kinds of reasons for believing that, in fact, Paul's experience was veridical (and that the gospels do not represent gradual mythical development, and that the disciples did say that Jesus' resurrection was in a physical body), but you do not strike me as an inquirer likely to be moved by reason in this area. Therefore, I do not intend to try to debate you on those points. This is J. P. Holding, an Internet-based apologist and member of the Theologyweb forum. I’ve come here to warn you about this character who has styled himself Celsus. You ought to know that he is a professional troll who has been repeatedly banned from TheologyWeb, especially for behavior like stalking, as well as profanity and blasphemy, and stealing the work of others without credit. You’ll want to review the following items, and I expect I speak for the owners of Theologyweb in suggesting that you would be wise to ban him as soon as possible. Since it says "transfigured" that means it was not the same "real body" that once walked around and was buried. It was different. Correct, the resurrection body is continuous with the mortal body but raised immortal. Traditional Christian doctrine affirms exactly what you are saying. So how does this support your argument? Paul envisioned a "heavenly" and "glorious" pneumatic body that rose to heaven. That is not the same description found in Luke and John where Jesus is seen interacting with his followers after his death. Sorry, Luke narrates the ascension and John explicitly foreshadows it. So Paul is in perfect agreement with both on this point. That Acts may contain other fictional elements is irrelevant to the fact that it contains Paul's own first person eyewitness testimony in Acts 22 and 26. That’s pretty hilarious. If you agree that it contains Paul’s own eyewitness testimony then on what basis do you call the parts that don’t fit with your theory fictional? You have to treat the evidence consistently, you can’t cherry-pick the data. Since this is the only firsthand report from our only eyewitness, it follows that the other "appearances" in 1 Cor 15:3-8 were originally thought of as similar in nature to Paul's vision. I believe I already said in an earlier comment (though it’s been a while) that the appearances were similar in nature to a certain extent, although Paul’s appearance was post-ascension and he referred to the appearance to himself as to one “untimely born,” suggesting that there was something unusual about it. But the appearance to Paul was clearly physical as even Gerd Ludemann acknowledges Paul implies by his testimony in 1 Cor. 9:1. You are simply begging the question. Luckily we don't have to rely on Witherington's apologetic obscurity because we have a precise description of the event from Paul himself. In that description he says that he saw a blinding light and heard a disembodied voice. He doesn’t say the voice was disembodied. That’s just what you have added to fit your obscurantist reading. The rest of this is just rhetorical fluff. This seems to be quite a normal thing for Paul since he admits to having "visions" and "revelations" - Gal. 1:12, 2 Cor. 12:1. I see nothing to even comment on here. If this adds to your argument in some way, you’re short a couple of premises. But if you add those premises it will be clear that you have no leg to stand on. The fact that the companions "saw no one" and "did not understand the voice" implies that this was a vision that only Paul had full access to. I’m not sure what it means to have “full access” to a vision, but if the companions had even partial access (whatever that might mean) it would still prove that it was an objective phenomenon. That’s all I need for my purposes, so you have implicitly given away the game. Furthermore, since there was a dazzling light involved that would account for the companions not seeing anyone. Also, differing auditory perceptions of heavenly voices is not isolated, also occurring in John 12:29. The problem for the skeptic is in explaining why Luke would manufacture a story this way if he was just writing fiction. This means the "vision" was somewhat of a subjective experience. That’s an odd statement. All experiences have a subjective aspect. The question is whether the experience is entirely subjective (ie. only happening in the person’s mind) or is caused by some external, objective reality. So to say it was “somewhat of a subjective experience” says nothing informative at best, but it also implies that something objective caused it. Again, that’s sufficient for my purposes. It helps your argument not a bit. You have to twist the evidence to make it fit your theory, and it doesn’t fit. Paul was blinded and the others were not because, evidently, they carried him on to Damascus. Clearly, they weren't "affected" in the same way Paul was. I agree they weren’t affected in the same way Paul was. But they were affected. Again, sufficient for my purposes. Why would Luke include the embarrassing fact that the companions "saw no one" if he wanted to be consistent and convey his belief in the bodily resurrection? Um, I think I’ve already made a similar point above, except that it doesn’t help your argument, it helps mine. This points to the veracity of the accounts in regard to Paul’s companions being affected, which proves that it wasn’t a subjective vision exclusive to Paul. This mitigates against Luke's own theological stance in which he depicts the Risen Jesus sitting down and eating with his disciples, providing "many proofs" and so on. Huh? Luke provided those accounts as well, so how does Paul’s appearance count against those? Just because Jesus didn’t sit down and eat with Paul? Your argument makes no sense whatsoever. What you’ve actually proven is that Luke was simply recounting what the eyewitnesses reported. He wasn’t just making stuff up based on his theological views or on what he thought should have happened. And again, the appearance to Paul had to have been objective and physical if the companions were affected in any way, shape or form. It makes not one whit of difference if their experience was different than Paul’s. Heck, two different people can be present for the same totally mundane event and report vastly differing experiences of it based on nothing but different viewing angles, positions, etc. But you are making a strong case for my position, and I appreciate that. Therefore, we have every reason to believe this is a legitimate report from Paul himself that reflects an earlier stage in tradition. There is nothing to suggest it’s an earlier stage in the tradition. You seem to forget that Luke-Acts is a two-part work by the same author. He got his material from the eyewitnesses, including not just Paul but also the other apostles. The evidence for that is as solid as it is for Acts containing Paul’s eyewitness testimony which you have already conceded that it does. Unfortunately, the only eyewitness account we know of is from Paul. So this assertion is merely wishful thinking at best. No, Luke had access to the other apostles just as Paul did, and just as Paul had to them. Acts 21:18 gives a first-person report of one such meeting. It's too bad that most of what we have is written in third person and filtered through a narrator who wasn't there writing decades after the supposed events. And yet you allow that Paul’s conversion testimony in Acts is reliable! Most scholars believe Paul’s conversion was within 1-2 years of the crucifixion. So Acts was written decades after Paul’s conversion, and by the same narrator who wasn’t there for that event either. Thus your argument is inconsistent – you have no reason to accept the one testimony as an eyewitness account and reject the others except for your preconceptions which cause you to contort the data. Unfortunately for you there is no reason for you to accept the one as firsthand and not the others. You have constructed a strange argument. You almost act as if Acts was written by Paul. It was written by the same author who narrated the other appearances, with virtually the same length of time having passed, and with the same amount of personal distance from the events. So all of your arguments against the reliability of the other appearances would also mitigate against the testimony of Paul which you nevertheless accept. Sorry, but you need an argument. You can’t just cherry-pick. I should clarify that even though Paul believed the resurrection was in some sense "physical" it does not follow that he believed the same body that was buried was the same one that rose out of the ground. The resurrection body in Paul’s view is continuous with the mortal body even though it is also different in that it is imperishable. But that’s just the orthodox Christian view. Oh, well that settles it then. Heh. Sorry, but you need an argument, not a hand-waving appeal to authority. I don’t see what it could mean if it’s not referring to something physical, but this is just a bare assertion and a weak one at that. Oh, dear. Another argument from silence. This one is a bust, because Paul is simply quoting a creed. The creed didn’t need to mention the empty tomb because everyone knew that if Jesus had been raised then the tomb would be empty. But there are many more arguments in favor of the empty tomb, so an argument from silence like this simply won’t cut it. Simeon’s original speech will have been delivered in Aramaic, and Simeon knew the text of Psalm 16 in Hebrew. Is this supposed to be Simon? As in Peter? He’s the one giving the speech in Acts 2, not Simeon. Anyhow, this argument is somewhat moot for a couple of reasons, one of which is that Paul uses the same text as part of the identical argument in Acts 13 in Antioch where he would have been speaking Greek and using the LXX. Futhermore, the LXX’s translation of shahat in Ps. 16 as diaphthora (“decay”) is a perfectly correct translation. So this argument appears to be nothing but empty bluster. Fifthly, the fact that none of the NT authors ever cite Hosea 6:2 as being inspiration for the "third day" belief may imply that its use was quite early and had already left its imprint on the tradition at a deeper level than an explicit citation could warrant. Oh, that’s a handy argument. It influenced the tradition and disappeared without a trace. I’m tempted to come up with some reductios for an argument like that but it doesn’t seem worth the bother since I’m not even sure what your argument is supposed to prove. Instead, what I was getting at is that the story involves linear development in chronological order - (Paul's description of the encounter was not with a revived corpse, important details are added that are missing from earlier reports, bodily appearances don't occur until Luke/John). Except that as I already pointed out, the testimony from Paul that you are basing this on is also from Luke. So your argument has exploded on the launch pad. In light of this, my conclusions become inductively true because what we have here seems to show a legend growing in the telling. No, what we have here is you forcing the evidence to fit a theory that you approached the data with at the outset. I like how your conclusions “become inductively true” though. An inductive argument is stronger or weaker, not true or false. And yours isn’t even strong. What would we expect if this story were actually true? A lot more consistency than we get. What would we expect if this story was made up? A lot more consistency. You actually have made a good argument in favor of the conclusion that Luke was reporting what the eyewitnesses told him, just as he said he was. That the appearance to Paul was similar in some ways to the others and dissimilar is some ways is consistent both with Paul’s own testimony that he was “untimely born” and also with the fact that the Gospel appearances happened before the ascension had taken place. The advantage of this view is that it doesn’t require the kind of selective cherry-picking of the data which you have engaged in. "Risen" in what sense? Did the author of Mark think that he was immediately taken to heaven? No, I don’t think he did. Why, do you have some evidence that he did? Wow, another argument from silence. And yes, this is an argument from silence. You are arguing for the conclusion that the bodily appearances developed later based on Mark and Paul not mentioning them (although Paul does clearly hold to bodily resurrection, and the fiction that he didn’t is simply mistaken). You really need to learn what an argument from silence is and stop using it . . .
You are mistaken. The proverbial expression "kick against the goads" was used by Aeschylus in Agamemnon 1624 which predates Euripides. It was an expression that signified resistance to divine will, so was perfectly appropriate in the context of Paul's conversion. J.P. - Looks like this Celsus has a lot of time on his hands, apparently for posting and re-posting the same bad arguments all over the internet. I always find that sort of obsessive behavior to be interesting, perhaps indicating a restless conscience. First of all, this jpholding guy is a liar. I posted this on theologyweb and all I received were insults and false accusations. I'm not the person he says I am. Just do a Google search for this guy and see how much credibility he has. Yes, I've posted this on other sites but it's only to become familiar with the objections that are brought against it. Paul's imagery and metaphor in 1 Cor 15 is ambiguous at best. You have to force read your preferred interpretation into the text in order to come to the conclusion that the "spiritual body" that's raised is the same one that was buried. That is not explicitly stated. This has generated centuries of debate starting with Marcion and Valentinus in the 2nd century all the way up to modern scholars today who still disagree on what Paul actually meant. I'm not going to play tennis with different interpretations of Paul but the fact that scholars still disagree is enough. "When Paul classifies the Damascus appearance with the other in 1 Cor 15:5 this is not merely because he regards it as equivalent....It is also because he regards this appearance similar in kind." "On this ground, the appearances are to be described in the sense of revelation rather than making visible." The whole "ascension into heaven" business is not found anywhere in Paul. It only develops later - in gLuke and gJohn - after the Resurrection has become a wholly physical revivification. Recreated speeches were usually fictional. See Thucydides Peloponnesian War 1.22.1-2. The 3 accounts regarding Paul's Damascus experience in Acts 9, 22, 26 are all genetically linked and we have every reason to believe that they go back to Paul himself. Therefore, on historical critical grounds, Luke probably had more of a hand in "recreating" the speeches of Peter and Paul in Acts 2 and 13 but in Acts 9, 22, and 26 it seems he just passed on a firsthand report from Paul himself! Paul shows no knowledge of a 40 day period of Jesus on earth then flying to heaven. You're reading that in from Luke. "Physical" doesn't mean he saw a risen corpse. Again, "When Paul classifies the Damascus appearance with the other in 1 Cor 15:5 this is not merely because he regards it as equivalent....It is also because he regards this appearance similar in kind." He doesn't say he saw a "body" either. The companions "saw no one". How do you reach the conclusion that he saw Jesus' corpse without reading in the later Gospel accounts? Since the guy was an admitted "visionary" I'd say that takes away his credibility a bit. You yourself said that Peter saw things that weren't actually happening (opama). So that's two of the earliest eyewitnesses who claim to have seen "visions". Wow, I'm starting to see a trend. Was the 1968–69 sightings of the Virgin Mary at St. Mary’s Coptic church in Zeitoun, Egypt objective? She was reportedly seen by tens of thousands, both Muslims and Christians. She was seen, but did not speak. What about the Miracle of the Sun? Was it objective? Don't you think if the sun actually zigzagged around in the sky that it would be noticed by people in other places on earth in addition to just Portugal? Unfortunately, we don't have any reports from the companions so we don't know how they thought of the experience. There is an interesting Old Testament parallel though. "Then the LORD spoke to you out of the fire. You heard the sound of words but saw no form; there was only a voice." So Luke could have inserted the companions as stage props to convey some sort of theological meaning. What do you think? And Paul didn't have an interaction with a risen corpse. That's sufficient for my purposes in that the earliest beliefs in the Risen Jesus were that of "visions". In Luke's gospel he is obviously motivated to present Jesus as a fully risen corpse. He actually goes out of his way to emphasize this point. He eats with disciples and says "Look at my hands and feet, touch me and see for a ghost does not have flesh and bones as I have". Why is there no mention of the physical body in Paul's reports in Acts? Criterion of embarrassment passes with flying colors here. That it comes from Paul makes it earlier by definition. Paul is the only eyewitness we can verify. We don't have firsthand reports from Peter, James, or the 500. And where does Luke describe the appearance to James? Where is James' firsthand description of the experience? We can only make historical judgments on the accounts we actually have I'm afraid. We've already established that Paul and Peter were susceptible to "visions". What do you wanna bet James was too? The accounts in Acts 9, 22, and 26 are all genetically related. Acts 22 and 26 have Paul speaking in the first person. Do you disagree that this is a firsthand report that goes directly to the apostle Paul himself? We have evidence that Luke was a companion of Paul, at least on some of his journeys, so this only bolsters Luke's position for transmitting an accurate report from Paul himself. We actually know who Paul was from his letters. We don't have the same degree of evidence for the other apostles. So you can call it "cherry picking" if you like but I'm just conducting proper historiography when I put primary sources over secondary ones. Most historians do the same. Aren't you just "cherry picking" the secondary bodily encounters over Paul's eyewitness testimony? Pot meet kettle. The bottom line is you have to accept the Acts accounts of the Risen Christ's appearances to Paul are visions, because that's what Acts describes. You can't have it both ways by accepting the Acts accounts of visions and then try to claim the 1 Cor 15 account as representing a risen corpse. "Flesh, blood, and pneuma are all parts of the body - or rather, different forms of substance that together make up a body. When Paul says that the resurrected body will be a pneumatic body rather than simply a psychic body or a flesh-and-blood body, he is saying that the immortal and incorruptible part of the human body will be resurrected- or, to put it more accurately, that the body will be raised, constituted (due to divine transformation) only by its immortal and incorruptible aspects, without its corruptible aspects such as sarx (flesh). No physical/spiritual dichotomy is involved here, much less a material/immaterial one...Paul would have thought of all of it as "material" - if, that is, he had been able to think in such a category without a material/immaterial dichotomy. At any rate, all the "stuff" here talked about is indeed stuff." Jewish literature is quite diverse on the topic of resurrection and the afterlife. There was no consensus view. These writings emphasize the continued existence of souls rather than the resurrection of the body. The book of Jubilees (c. 170-150 BCE) uses resurrection language together with the idea that the bones of the righteous rest in the earth while their spirits rejoice (Jub. 23:30-31). "Statements on an immortality of the soul which excludes the resurrection of the body are almost as common as those which explicitly state the resurrection of the body..."
All this illustrates the massive variety of beliefs which Jesus’ followers could generate after Jesus’ death. For more see Maurice Casey's Jesus of Nazareth starting on page 466. Arguments from silence can be inductively true. You can't say with certainty that the empty tomb is implied in 1 Cor 15. At best, all you can say is Paul may have known about it but didn't mention it. That would be complete speculation however. This is another case where you're letting your knowledge of the later gospel stories affect your reading of Paul. 40:3-4. The disappearance/assumption motif is used to explain what happened to the bones of Job's dead children. They were taken up to heaven by God and glorified. has taken Callirhoe up to heaven. This is just an example of how common the idea of apotheosis was in the period and shows how there was already a set of tropes that the Gospels could adapt for their narratives. I'm not arguing for direct dependency or copying but it does show that the empty tomb story in Mark was nothing new. writing), given that round stones were quite rare in Jesus' time. Kloner says that the word can also mean "to move" but he is incorrect. The word was only used in regards to round objects. consistent with tendencies in ancient hero biography. as opposed to a dishonorable one. in a common criminal's tomb. "When they had carried out all that was written about him, they took him down from the cross and laid him in a tomb." gather my soul with the sinners" (26:9). In b. Sanhedrin 47a - "a wicked man may not be buried beside a righteous one." (criminal burial/crucified between two criminals) and with the rich (Joseph of Arimathea) in his death." So the composer of the narrative just "fulfilled" prophecy by creating the story of the empty tomb. are other traditions that indicate things were not as straightforward as the canonical gospels might indicate. For example, the Secret Book of James has Jesus refer to how he was "buried in the sand"
meaning it was a shameful burial. An early variant of John 19:38 also has "they" as in "the Jews" taking Jesus away for burial. This is also found in the Gospel of Peter 6:21 and in Justin Martyr: Dialogue 97.1.
and action of the Sanhedrin (Luke 23:50-51)...someone who was a friend not only of Jesus but also of Pilate (Gospel of Peter 3). So the story of Joseph of Arimathea is not completely impossible to invent." Hans Grass, Ostergeschehen und Osterberichte, pg. 180.
was supposedly "alive" and without his remains. Paul doesn't mention the "body" and there is no "empty tomb" mentioned anywhere in the speeches of Acts. Since we have evidence that ancient authors invented speeches (cf. Thucydides Peloponnesian War 1.22.1-2) it's more likely Luke is transmitting his own belief in prophecy. This connection with the bodily raising from death was thus only possible from the existing Greek translations, while in the Hebrew it is clearly excluded. The fact that it says "according to the scriptures" pretty much means they turned to the Old Testament. You completely ignored the other "third day" references so we can tell you don't have an actual response to this. This third day motif was utilized just like the 40 day/year motif throughout the OT and NT. It had theological significance so it was only natural that they applied it to Jesus' resurrection. The "risen on the third day" is not a historical piece of information. It's just a theological construct. I'm sorry, are the parts in Acts 22 and 26 where Paul is speaking in the first person supposed to be an eyewitness account or not? It sounds like you're trying to imply that Luke made it up because you don't like the fact that it describes a "vision" instead of something more concrete like the gospels describe. Again, the bottom line is you have to accept the Acts accounts of the Risen Christ's appearances to Paul are visions, because that's what Acts describes. You can't have it both ways by accepting the Acts accounts of visions and then try to claim the 1 Cor 15 account as representing a risen corpse. 4. Luke 85-90 AD - Jesus eats with the disciples, says "look at my hands and feet, touch me I'm not a ghost"
Sorry but there IS growth here. To argue otherwise is denying the obvious. Not just "similar" he is equating his vision with the resurrection appearances to the others in 1 Cor 15. Oh, and where does Paul mention the ascension? Or is that a development that happens 30-40 years later? See argument #2 against the historicity of the empty tomb above. I'm arguing that the story shows growth and legendary accretion over time. Spot the difference. I know who J.P. Holding is. I even own one of his books. Also, I read some of the links that he posted, and I can say that your statement that all you received were insults and false accusations is not true. Then the accusation that you were posting this on different sites under different names is not a false accusation as you claim. Whatever – you haven’t done anything to earn my ire yet. Not at all. The analogy Paul uses is of a seed and what grows from the seed, indicating continuity even though the end product has different characteristics. I see no ambiguity at all. Just pointing out that some scholar somewhere made an argument is not itself an argument! If you can’t defend your view, then stop wasting my time. The important parts that support my argument from the Theological Dictionary of the NT, and which you left out, were these: "When Paul classifies the Damascus appearance with the other in 1 Cor 15:5 this is not merely because he regards it as equivalent....It is also because he regards this appearance similar in kind." Yes, I agree that the appearance is similar in at least some respects, and as I have already pointed out the objective and physical nature of the appearances is clear in all of the accounts including Paul’s. I don’t understand this statement. Every single version of the appearances describes something visible. “Revelation” and “visible” are not mutually exclusive categories. Boy, another argument from silence. But again, this one is a fail. First of all, Phil. 2:9 is part of an early creed which is a pretty clear reference to the ascension. Of course Eph. 4:8-10 is unquestionably a reference to the ascension. I realize many scholars think Ephesians was written by someone other than Paul, but those arguments are based on presuppositions and linguistic arguments which are fundamentally flawed. I could do more digging, but again it doesn’t seem worth it. You have made an assertion based on an argument from silence. All of your arguments to the effect that “Paul (or whoever) makes no clear mention of such-and-such so therefore is developed later” is simply a fallacious argument. But I’ve noticed it’s also one of your favorites, probably because you think you can make a point with no evidence. Sorry, doesn’t work that way. Recreated speeches were usually fictional. See Thucydides Peloponnesian War 1.22.1-2. You have misunderstood Thucydides for starters. He doesn’t say his speeches were fictional, he says he attempted to stay as close as he could to what was actually said while composing speeches appropriate to each occasion. Secondly, Luke’s speeches in Acts show no signs of the kind of rhetorical excesses that characterized some speeches. They are all quite short and condensed summaries. Thirdly, we know from how Luke utilized his sources (such as Mark) that he didn’t embellish speech materials but stayed very close to his sources. So whatever the practices of some ancient historians might have been, we can observe Luke’s first-hand. The 3 accounts regarding Paul's Damascus experience in Acts 9, 22, 26 are all genetically linked and we have every reason to believe that they go back to Paul himself. Yeah, I already granted that they go back to Paul. But they also all fit the exact same list of criteria that you use to dismiss the accounts of the other appearances – removed by decades after the event, written down by someone who wasn’t there, etc. Therefore, on historical critical grounds, Luke probably had more of a hand in "recreating" the speeches of Peter and Paul in Acts 2 and 13 but in Acts 9, 22, and 26 it seems he just passed on a firsthand report from Paul himself! I’m afraid you have simply ignored the refutation and restated your original conclusion, but if Paul’s testimonies are to be accepted as authentic then there is no prima facie reason to reject these other speeches. Paul shows no knowledge of a 40 day period of Jesus on earth then flying to heaven. Another argument from silence. I’m just going to have to start flagging these and then ignoring them. You are wasting my time. I never said he saw a corpse, but neither did the other apostles. They saw Jesus alive. Don’t you know what a corpse is? And the reason I know Paul saw Jesus is because he said so himself in 1 Cor. 9:1. THAT is Paul’s firsthand testimony. Since the guy was an admitted "visionary" I'd say that takes away his credibility a bit. I’d say it doesn’t. This is just prejudice. You yourself said that Peter saw things that weren't actually happening (opama). So that's two of the earliest eyewitnesses who claim to have seen "visions". Wow, I'm starting to see a trend. The “trend” that you should have noticed is that personal visions are clearly distinguished from objective pheneomena in Luke’s account. He also describes Stephen having a vision of Jesus in Acts 8 which was not counted as an appearance. In other words, Luke knew the difference between these different kinds of phenomena and didn’t change visions into objective experiences. He just reported what the eyewitnesses said. Beats me, but it’s not relevant to this discussion. Ditto to my above answer. Deuteronomy 4:12 "Then the LORD spoke to you out of the fire. You heard the sound of words but saw no form; there was only a voice." So Luke could have inserted the companions as stage props to convey some sort of theological meaning. What do you think? I think you just shot yourself in the foot. You keep insisting that Acts describes Paul's experience as a vision but now you posit that Luke inserted the companions as a theological device. But in that case, you can't also say that Luke is describing a vision, so you are contraditing yourself. But apart from that, why on earth would this verse in Deut. be evidence that Luke inserted the companions as “stage props”? And why did he feel no need to do anything like that with Stephen’s or Peter’s visions? Earlier you said that the accounts of Paul’s conversions “mitigate against” Luke’s theological perspective which you used as an argument for the genuineness of the accounts. Now you claim that he added the companions for a theological purpose. You are arguing out of both sides of your mouth. If Luke had a theological purpose in YOUR view, he should have described Jesus walking, talking and eating with them all, right? Again, you are simply treating the evidence in a selective, ad hoc manner to fit with your predetermined conclusion. Paul says he saw Jesus. And since as I have pointed out in several different ways the experience described by Luke is not a vision (in spite of the fact that Luke is perfectly capable of describing visions if that’s what the eyewitnesses reported), your thesis fails. But if you are simply going to keep ignoring rebuttals and repeating your conclusions ad infinitum, I’m going to have to start dismissing you as a troll. My argument is that the experience was not an inner, subjective vision. Try reading again, I’m not going to keep repeating arguments I’ve already made, especially since you keep ignoring them. Why is there no mention of the physical body in Paul's reports in Acts? Criterion of embarrassment passes with flying colors here. Yep, I covered that angle already. I agree, it points to the authenticity of the accounts. I’m not sure why you’re arguing for something we agree on. It’s just that Luke is also the one who wrote the other accounts, and they are just as credible. You have nothing but hand waving in response to that. That it comes from Paul makes it earlier by definition. Luke and Acts were written at the same time, and the other apostles were converted before Paul came along. He even says that he received the creed in 1 Cor. 15, and that must have been from them. So you are utterly mistaken. Paul is the only eyewitness we can verify. We don't have firsthand reports from Peter, James, or the 500. Again, this is a bizarre argument. You treat Paul’s speeches in Acts as firsthand reports and not the other appearances even though they are all found in the same source. And again, Luke-Acts is a single source; it’s a two-part work. I never said Luke describes the appearance to James. The point is that Luke had the same first-hand reports of all of the apostles, not just Paul. “Established”? That Peter and Paul both had visions along with many other people in the Old and New Testament is news to nobody who has read the Bible. If that in your mind discredits them then why are you wasting everyone’s time here? None of that, of course, is any reason to think that James ever had a vision of any kind - "bets" of yours nothwithstanding. The accounts in Acts 9, 22, and 26 are all genetically related. Acts 22 and 26 have Paul speaking in the first person. Do you disagree that this is a firsthand report that goes directly to the apostle Paul himself? Have you read anything I’ve written? We don't have the same degree of evidence for the other apostles. Even if this were true (which it isn’t), you seem to be assuming that Luke was faithful in reporting what Paul said but then just made up whatever he wanted for everyone else. But you have no reason for such an assumption. As for Luke’s verifiable accuracy as a historian, I recommend Colin J. Hemer’s study, The Book of Acts in the Setting of Hellenistic History. So you can call it "cherry picking" if you like but I'm just conducting proper historiography when I put primary sources over secondary ones. I’d love to meet even a single historian who calls a story from Acts a primary source and a story from Luke a secondary source. That’s absolute rubbish. What you are doing is arbitrarily counting different parts of the exact same text differently. You can’t count the account of Paul’s appearance as a primary source and the other apostles’ as secondary because they're from the same source. You are making assumptions about the sources that Luke used in writing his work, but you don’t have any evidence for those assumptions. Not only that, but the evidence points to Luke as an accurate historian. Aren't you just "cherry picking" the secondary bodily encounters over Paul's eyewitness testimony? Pot meet kettle. Um, no. I’m treating the accounts consistently according to the evidence. It’s funny to see you resort to a tu quoque as if that’s a good argument though. It’s not an improvement over your arguments from silence. The bottom line is you have to accept the Acts accounts of the Risen Christ's appearances to Paul are visions, because that's what Acts describes. As I have shown, this is false even by your own tacit admission above. No, this is simply wrong. Paul says of the resurrection that we will be “changed.” He doesn’t say that the body will not be raised, but he says it will be transformed into an immortal state: “For this perishable must put on the imperishable, and this mortal must put on immortality.” In Martin’s interpretation the perishable is simply left behind, but that’s not what Paul says. I’m not sure what this is supposed to prove. Even in the New Testament you have the dispute between the Pharisees and the Sadducees about resurrection, because the latter did not believe in resurrection. But Jesus sides with the Pharisees, and Paul himself was a Pharisee and thus held to the view of bodily resurrection. Arguments from silence can be inductively true. “Inductively true” is a nonsensical phrase. I tried gently pointing that out to you already, but you are simply showing that you don’t know anything about logic. Most arguments from silence are bad. There can be good arguments from silence, but you need a lot more than what you’ve given. You can't say with certainty that the empty tomb is implied in 1 Cor 15. At best, all you can say is Paul may have known about it but didn't mention it. That would refute your contention that Paul didn’t know about it then, wouldn’t it? That would be complete speculation however. Since Paul held to the Pharisaical view of resurrection, it involves almost no speculation. This is another case where you're letting your knowledge of the later gospel stories affect your reading of Paul. Nope, you are simply reading Paul based on your presumptions. 1. It is not multiply attested as apologists normally like to espouse. Matthew and Luke both copied Mark. John was written at such a late date that it was likely influenced by Markan tradition. First, there is no evidence that John was influenced by Mark. The consensus is that John is independent of the synoptics. Second, skeptics like to point out the differences in the post-mortem accounts which is actually an indicator of independence. When Matthew and Luke are copying Mark, they stick very close to verbatim. In the post-mortem accounts this isn’t the case. Besides, the earliest testimony about Mark that we have is that he based his account on Peter’s own testimony. 2. Similar stories involving the disappearance of bodies and "heavenly assumptions" were quite common in this time period. A Jewish example is the Testament of Job 39:8-13; 40:3-4. The disappearance/assumption motif is used to explain what happened to the bones of Job's dead children. They were taken up to heaven by God and glorified. The Testament of Job only has 12 chapters. A more interesting Greek example is found in the 1st century novel by Chariton, Chaereas and Callirhoe 3.3. The hero Chaereas visits the tomb of his recently dead wife saying he "arrived at the tomb at daybreak" where he "found the stones removed and the entrance open. At that he took fright." He finds it empty and concludes that one of the gods has taken Callirhoe up to heaven. Sound familiar? Yeah, this another of those canards that seems to make the rounds. I think someone already used that one on a different thread. First of all the dating on this is imprecise and may be as late as the second century. So if there was any connection between this text and Mark, it might well have been Chariton borrowing from the Christian story. 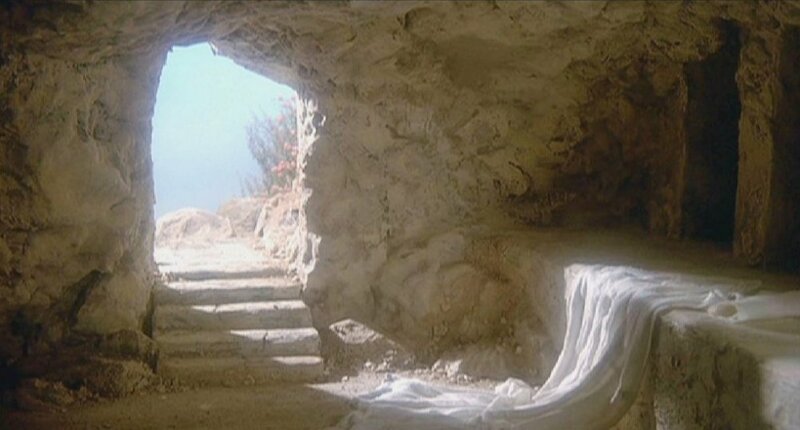 But there is no resurrection in Callirhoe, just the discovery of an empty tomb. But just saying that there is another story with an empty tomb is not an argument for anything any more than saying that because there are other stories of shipwrecks that proves that the Titanic is a legend. A survey of First Century Jewish rock cut and cave tombs by Amos Kloner found that 98% of them were closed by square stones prior to 70 AD, with only four closed by a rolling round stone. After 70 AD, however, round stones became far more common. So this detail seems to be indicating the kind of tomb in the later First Century (when Mark was writing), given that round stones were quite rare in Jesus' time. This is a bad argument even if your sourcing is correct. You might make more headway if nobody used round stones prior to 70, but the fact that there were some indicates that Mark’s account is plausible. Furthermore, if the number 4 represents 2% that means that you are dealing with quite a small sample size so the statistical analysis is correspondingly poor. This is a non-starter. 4. In regards to the burial of Jesus it should be pointed out that the narrator of Mark had a strong motivation to present his hero Jesus as receiving a noble rather than a shameful burial, consistent with tendencies in ancient hero biography. Let me correct some of the nonsense you have spewed here. Funnily enough, someone else on another thread tried posting some of this same garbage, so apparently they dig through the same internet trash pile that you do. First of all, the Secret Book of James, which is available for free on the internet and is quite short, says nothing about Jesus being buried in the sand. I don’t know who started that one, but it is easily debunked. Second of all, not only is a member of the council taking the body of Jesus off the cross not unlikely, it is exactly what both Jewish and Roman law would have required in the case of Jesus. First, Deut. 21:23 required that a body hung on a tree had to be buried before nightfall. The categories of the executed that are mentioned in your source are for those executed by stoning, burning, beheading, and strangling. The reason crucifixion is not mentioned is because that was not practiced by Jews; it was a Roman method. The Jews sometimes hanged dead bodies as a public display, not live ones as pointed out by Jodi Magnes in the Journal of Biblical Literature. Since there wouldn’t have been time to dig a grave and since the responsibility for disposing of the body would have fallen on the Sanhedrin, the Gospel accounts are consistent with the archaeological and historical evidence. Roman law dictated that local customs for burial be followed where possible. Oh, and the Gospel of Peter says that Jesus was buried by Joseph of Arimathea. Someone tried that one on the other thread also. You should check your sources before trying to use them in an argument. 5. We have no record of Jesus' tomb being venerated or even the location mentioned until it was "discovered" in the 4th century. Quite strange for the exact spot where God raised Jesus from the dead to go unmentioned for 300 years don't you think? And yet another argument from silence. By this logic, however, nobody came to believe in the empty tomb until the 4th century which is clearly nonsense. The location of the tomb would have been lost after the destruction of Jerusalem in 70 in any case, and we simply don’t know what Christians did with the empty tomb before that. The objection "because Jesus was alive" or because "his body wasn't there" doesn't work because the Church of the Holy Sepulchre became venerated when Jesus was supposedly "alive" and without his remains. Other places of significance in Jesus’ life also became venerated during later centuries, such as the alleged site of his conception and so forth. I don’t have any particular view on the current location of the empty tomb, but when saints are venerated the remains are of particular interest to people rather than the burial location. However, none of this constitutes an argument against the authenticity of the empty tomb tradition. Paul doesn't mention the "body" and there is no "empty tomb" mentioned anywhere in the speeches of Acts. And more arguments from silence . . . The fact that it says "according to the scriptures" pretty much means they turned to the Old Testament. Of course they turned to the Old Testament! They were Jews! You completely ignored the other "third day" references so we can tell you don't have an actual response to this. Sorry? What other third day references are you talking about? And who is “we”? Do you have multiple personality disorder? I'm sorry, are the parts in Acts 22 and 26 where Paul is speaking in the first person supposed to be an eyewitness account or not? It sounds like you're trying to imply that Luke made it up because you don't like the fact that it describes a "vision" instead of something more concrete like the gospels describe. It doesn’t describe a vision which has already been pointed out and refuted multiple times. Visions don’t affect other people. You can say with no evidence that Luke invented the companions, but you can’t claim that he is describing a vision. He describes visions in other places, but not in Paul’s testimony. Also, the point of my argument is apparently going clear over your head. Yes, Paul’s speeches in Acts are supposed to be eyewitness accounts, just like the appearances to the other apostles in Luke, and just like the rest of Luke-Acts. Again, you are treating the evidence selectively and inconsistently. If Luke was able to accurately reproduce Paul’s speeches for his testimony, then he was also able to accurately reproduce a narrative of the experience as well as all of the other speeches. Furthermore, because Luke was a traveling companion of Paul (as you have already admitted), he knew very well what Paul knew about the testimony of the other apostles. Don’t forget that Paul himself checked with the other eyewitnesses, specifically including Peter and James (Gal. 2). So Luke had ample checks on all of his information. Again, the bottom line is you have to accept the Acts accounts of the Risen Christ's appearances to Paul are visions, because that's what Acts describes. Again, no it does not. At this point you are simply being disingenuous. It is an absolute lie to say that Acts describes Paul’s encounter with the risen Christ as a vision. What is obvious is that you are simply unwilling to look at the actual evidence, instead forcing it into your pet theory. Not just "similar" he is equating his vision with the resurrection appearances to the others in 1 Cor 15. No, he doesn’t equate them. He says that Christ appeared to him last of all “as to one untimely born.” This implies that there was something unusual about it, particularly with regard to the timing of it which is consistent with what I have pointed out with respect to the ascension. The one in which you cited a reference that doesn't exist? Your theory shows growth and legendary accretion. The story not so much.